When I was 18, in 1986, my last year of school, for me the culture of the late 60s was akin to oxygen. People thought I was crazy. Said I was living in the past. Personally, I saw my passion for the 60s as a necessary enrichment of my present in an age when, on a brand-new thing called MTV, the most important thing about a pop song was now the video not the music. Were the people of the Italian Renaissance living in the past by delving back into Classical ideals to lift themselves up out of the Dark Ages? And why isn’t Mozart considered ‘retro’ whereas The Doors are? For the original hippies – the Baby Boomers – the film they saw as defining the spirit of their generation was ‘Easy Rider’. What was that defining film for us Generation Xers? Oh, yes… ‘The Breakfast Club’. What a wonderful icon of a Golden Age it wasn’t. Perhaps Freddy Kruger targeted my age group precisely because we were so lame. 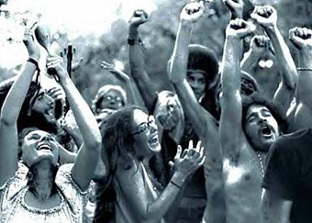 Indeed, Generation X seems to have been defined by its resentment of the original hippies. Why this resentment, this Gen X retro cringe at the youth of the Psychedelic Era? Because they believed that something as ephemeral as pop music just might change the world? Stop a war? Because this belief was hopelessly naïve and doomed to failure from the start? Of course it was. But you have to keep in mind that the pop music of the 60s was of such high quality that it had the youth of the 1960s believing the illusion. And the First World youth of the 1960s weren’t ignorant apparition-seeing hill-dwellers either. They were the best educated generation in history. And their pop music was so intoxicating that it had them believing the Impossible might be Possible. Perhaps the defining pop song of Generation X was Nirvana’s ‘Smells Like Teen Spirit’. (It seems I was the single person on the planet who wasn’t moved by this band.) But many times did I hear Cobain fans effuse how the song ‘really captured the spirit of a generation’. In fact, I heard this line so many times that I had a prepared reply for it. ‘In what way?’ I would always ask. The thing is, every time I asked this, I always (always) got the same answer.